Heat oven to 425 degrees. 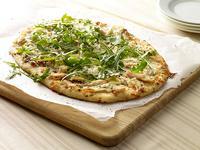 Roll or press pizza dough to 8-inch imperfect circle. In small bowl, combine thyme, butter an garlic. Brush half the butter mixture over pizza dough. Spread dough with onion jam. Top with turkey, Brie and Provolone cheese. Drizzle with remaining butter mixture. Bake 12 minutes or until crust is crisp and golden. In small bowl, toss arugula, vinegar, oil, salt and peper, if desired. Place on cooked pizza. Cut pizza into wedges.